Doing well in local organic search rankings and Google 3 pack results are very important for businesses of all sizes but can make or break a small business. They are both huge opportunities for local businesses of all sizes to get exposure and potentially get new customers. If you are a local business and you want more customers, the Internet is a great place to find them. Any business that starts showing up in local organic search results and in Google maps 3 pack results for good and relevant keywords can increase their exposure significantly, potentially getting thousands of more sets of eyes on their website. Even if only 5 of 100 potentially become customers, for every 1,000 views that means you have 20 more clients! Conversion rates are always going to vary by industry, but regardless of what your industry is people need to know about your business to become a client or customer. Learning to show up in local search results through utilizing local SEO and optimizing for Google 3 packs is a great way to get sustainable growth for any business. It will take time, effort and know-how to do it right, but the returns are worth it. With ad spend your money is gone after the ads, if you produce content continually to boost your rankings in SEO you can climb higher and higher in rankings and continue to get more website views and potential clients! There are a lot of factors that go into ranking well for both local organic search and Google 3 packs on Google Maps. Here I am breaking down all of the most important parts of both so that you can go apply these lessons and start your journey toward ranking. This post is meant to give you the overall understanding of all the different factors of SEO for both Google 3 packs on Google Maps and for local organic search rankings so that you know how to best strategize with your time, effort, and/or money. Can I Rank After Reading This Article? If you make the changes suggested in this article you could potentially start ranking on Google Maps for 3 packs within a week. So make sure to make the needed changes! Local organic search is much harder, as many of the ranking factors have to do with having a well-optimized website for SEO in general. This is something that will either take a substantial amount of time investment or will take paying a professional. There is a learning curve involved with SEO, so if you are doing it yourself make sure you get a tracking tool for rankings and pay attention so you can adjust as needed. If you do this DIY style it will take you longer than hiring a professional. It takes making mistakes to learn in this business and continually adjusting. This guide can also help be used to help give you the necessary understanding you need to be able to make sure the professional you hire is knowledgeable. Just because somebody calls themselves an ‘SEO’ does not mean they know what they’re doing. With Google’s recent updates focusing even more on the location of the person searching, this can potentially even out the playing field even more for any business that has a good location but not necessarily a great web presence. While this has been the case for a long time for mobile SEO, it seems that it is now quite important for desktop searches as well. • What Did we Learn From This Short Case Study of Google Maps 3 packs? 4. Directories: Which Directories are Important? • Be Sure Your Directories are Secure! 6. Can I get a Google Certified SEO? 7. How Important are Reviews to Local Rankings? 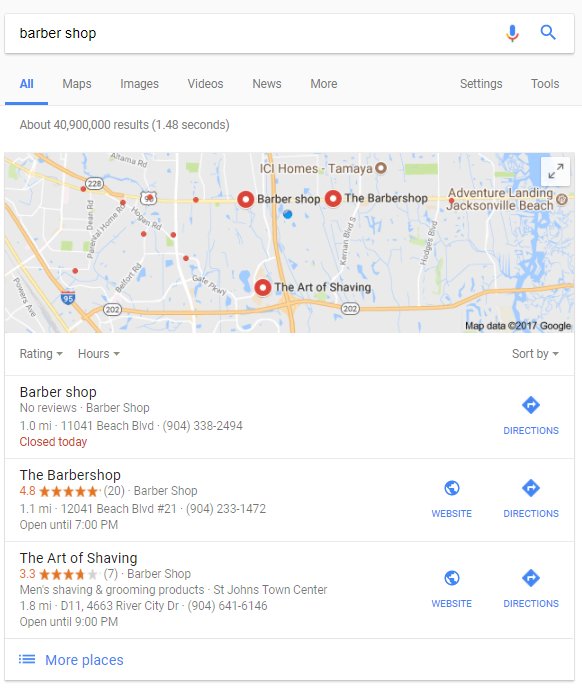 Google is pretty good at telling the difference of when someone is searching for an informational search where local results are not important and a transactional search where they are looking for a local business. Later we will go through a short test to show some results of a local search with intent to buy at a local business. 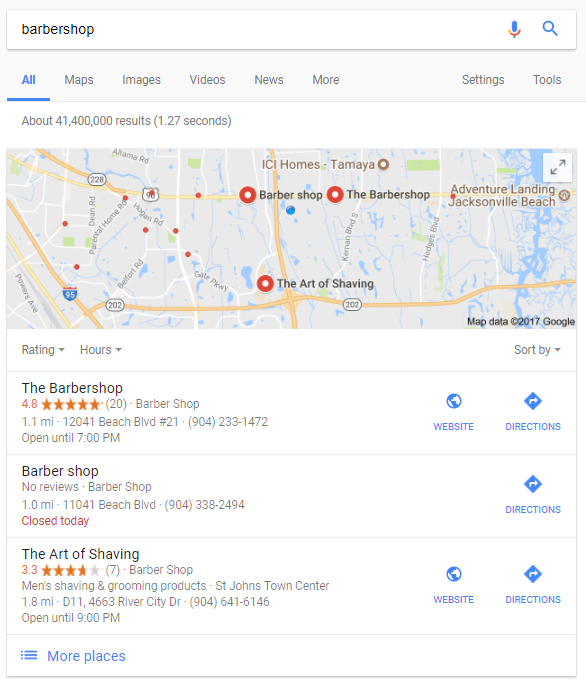 While there is plenty of overlap between what is important in both local organic searches and Google local 3 pack results in maps, there are also a number of factors that are much more important with 3 packs than with organic searches. With that, let’s dive in to do some testing on Google Maps 3 packs to see what we can find out. Proximity to the searcher is so important that sometimes businesses will rank on the Google 3 pack that are close by even if they didn’t have a website! Categories are also very important, as sometimes categories that might seem synonymous to you are not to Google. Our unreviewed and unclaimed business called ‘Barber shop’ with no rankings is #1 on Google. Google Earth shows a Flea Market with no ‘barber shop’ in sight. It is also closed, although this search was done between 6-7pm so maybe Google doesn’t mind. Search done immediately after. Even an exact match for the other ‘Barbershop’ (result #2) does not switch results. With both the category and the actual name so similar, being only .1 miles closer seems to be the only advantage for ‘Barber shop’, even though it is closed! At about 11:30am shows our no website ‘Barber shop’ is now second to the ‘Barbershop’ with 20 reviews and a 4.8 rating. Perhaps because the first is closed all day and this is a time it would be expected to be open. This is just a guess, but there aren’t many factors that have changed. This search is done right after the last one. It seems that whatever combinatoin of factors that caused the first change in order to happen is not very strong, as now the order had been restored. It seems an exact match for the name ‘Barber Shop’ was enough to turn them around again. It seems that the close keyword match of ‘hair cut’ and ‘Hair Cuttery’ might have been enough to get Hair Cuttery #1. This is probably partially because the proper term is ‘haircut’, as you can see from Google’s suggestion. These very similar keywords turns up very different results, and results farther away. 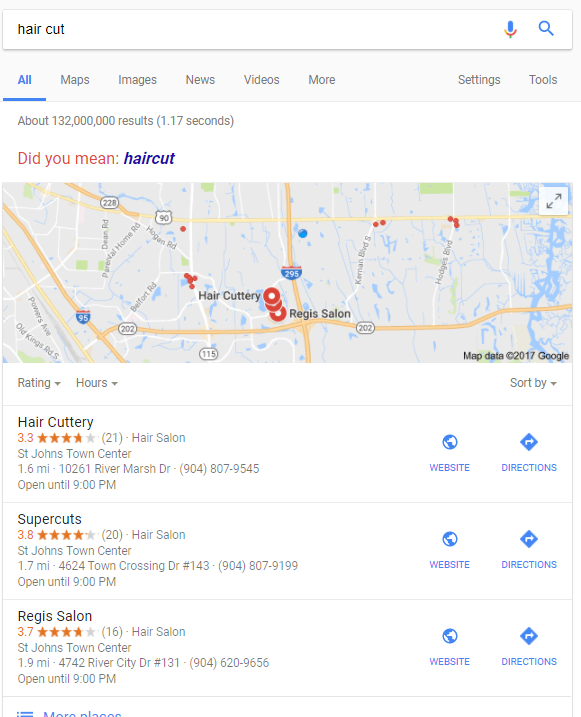 It seems that Google considers ‘hair salon’ to be a better category match than ‘barber shop’ for ‘hair cut’. This is likely because barber shops are targeted at men. With ‘hair salon’ it seems that having the words ‘hair’ and ‘salon’ in the title of the business is helpful. Notice #2 and #3 are both 1.7 miles away compared to .4 miles for #1. Then…there’s this. Haircut near me turns up all big chains that are a minimum of 1.7 miles away despite there clearly being other options much closer (including the 2 barber shops from the first search and all 3 salons from the last search). 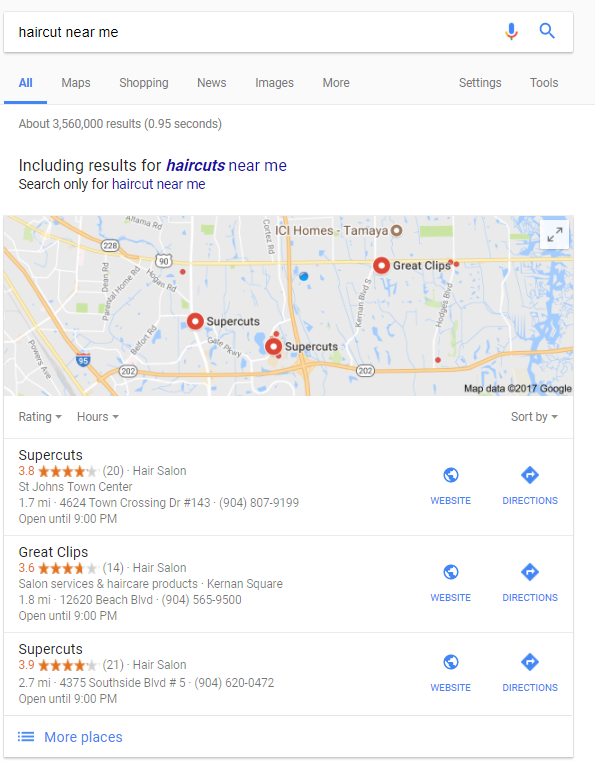 It also turned up two different locations for Supercuts, which other research has led me to believe Google is leaning away from (unless you do a brand-specific search). Probably a number of factors at work here. Supercuts has certainly had a presence but has not been dominant until this last search. Overall a good showing for local businesses up until this point. What Can We Learn From This Short Case Study of Google Maps 3 packs? Obviously, we need a bigger sample set to draw any real conclusions, but this goes to show how just a brief examination of Google results can be quite surprising. Even with just these few searches, it gives us some ideas about the importance of different factors, and perhaps just as importantly gives a sense of how much variability there can be in search results. Despite the similarity of barber shop, hair salon, and haircut Google clearly does not think they are the same. 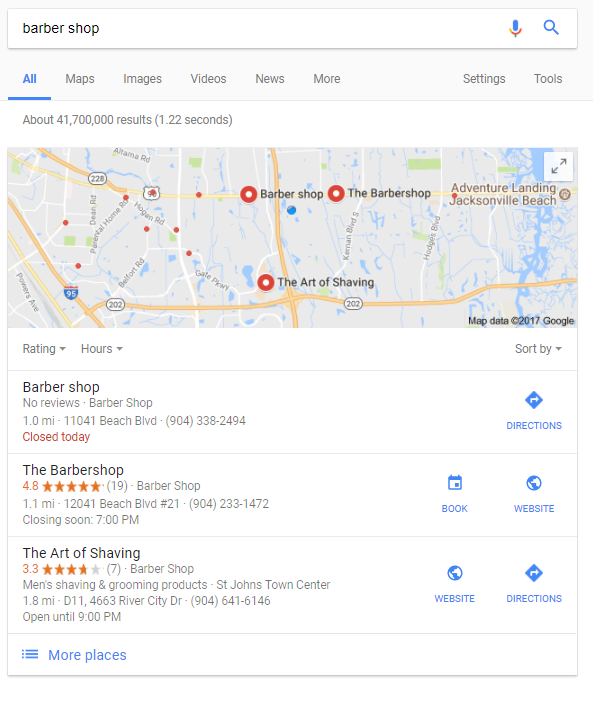 It can be very hard to overcome just a .1 mile distance in Google 3 pack results as even with an exact match in keywords (‘barbershop’ instead of ‘barber shop’), reviews vs. no reviews, website vs. no website and open vs. closed it was only enough to get the #1 ranking 1/2 times. Why the difference in results for the same searches at different times? Maybe because the first was closed all day the second time and the search was performed midday when it would otherwise be expected to be open. We would need more testing to verify this, but there are very few other variables that we can see. When the third barber shop is open, 1.8 miles away, and has a website and 7 reviews (although only a 3.3 rating) this is not enough to overtake the business 1.0 miles away, with no site or reviews. This could also be attributable to exact keyword match (or almost exact with ‘barbershop’. One of the biggest lessons that comes from this is that Google rankings are ever changing and that there’s a lot of different factors to take into account. Even though these terms are very closely related, they turned up rather different search results minus Supercuts. Without further research, it is hard to tell if the name of the business is really that important if the categories chosen are more important, and how important the location really is if the name wasn’t an almost exact match. Luckily, other people have already done much of the heavy lifting to decode how Google works with much more quantitative and reliable means of research. To get accurate results it takes a lot of data, and while isolated experiential data can certainly aid in understanding, it should rarely if ever be used as the only source of information! You can also read more about figuring out how to stay on the first page of Google. NAP stands for name, address and phone number. The consistency of all 3 across your listings is one of the most important factors for showing up in Google 3 packs and local organic results. Take this seriously. Making changes can be tedious, but it is necessary. There are ways to partially automate this process to make it less painful like using Moz Local. 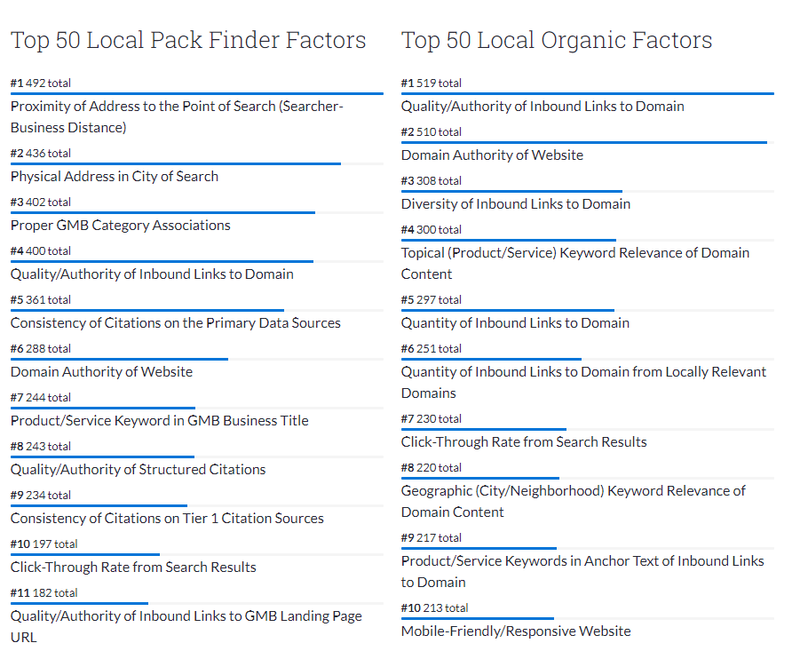 Much of the information I will be using in this article comes from Moz’s 2017 Local Search Ranking Factors Study, and I wanted to devote a moment to tell you why. Moz surveyed 40 of the top SEOs in the country and asked them what they thought the most important factors are for local search and local Google 3 packs. To give you an idea of how important other people think this study was, in a Google search for ‘local search ranking factors’ Moz’s survey results not only show up in the top 2 positions with their own site, but 9 of the top 10 positions are all talking about these specific survey results and many of which on well-known sites– to people in the SEO world at least. This also shows the power of high-quality, original research for SEO. So it’s not Google telling us how this stuff works, but it’s insight from some of the best people who work to rank their clients on Google every day. To learn more about what Moz metrics can tell you take a look at our Jacksonville SEO case study using Moz metrics. NAP needs to be as consistent as possible across all major directories. It is not necessarily the end of the world if you have some smaller directories that aren’t perfectly matched up, but if they are displaying an old or different address they still might be worth changing. Any discrepancies will cause Google and other search engines to trust your business less with each discrepancy. The lesser the directory the lesser the importance, but if you have an older business and know you have a lot of old information floating around the internet it is worth either cleaning it up yourself or investing in a service like Moz local to help you do it. If you need to do some initial cleanup you can pay to use the service for one year and once you have cleaned up your listings you may not need it the next year. Facebook forces each page to have a different name, so if you have multiple locations you will have to have different names for different locations. So does everyone else, so this isn’t a problem. While Bing is very clearly the second priority to Google My Business, this is still a free resource that should not be wasted and a lot of people forget about it. Now that Google has replaced Bing as the brain behind Siri Bing is even less important due to the large loss in market share, but it takes minimal effort to set up an account properly and could potentially get more clients. Directories: Which Directories are Important? This is a great place to start to find the most important business listings. Whitespark also has a great list of best citations by category for different types of businesses from accounting, construction and hair salons to doctors, bars, veterinarians, and yoga studios. They have dozens of different categories, and I would recommend checking out yours to see if there is anything worthwhile specific to your industry. 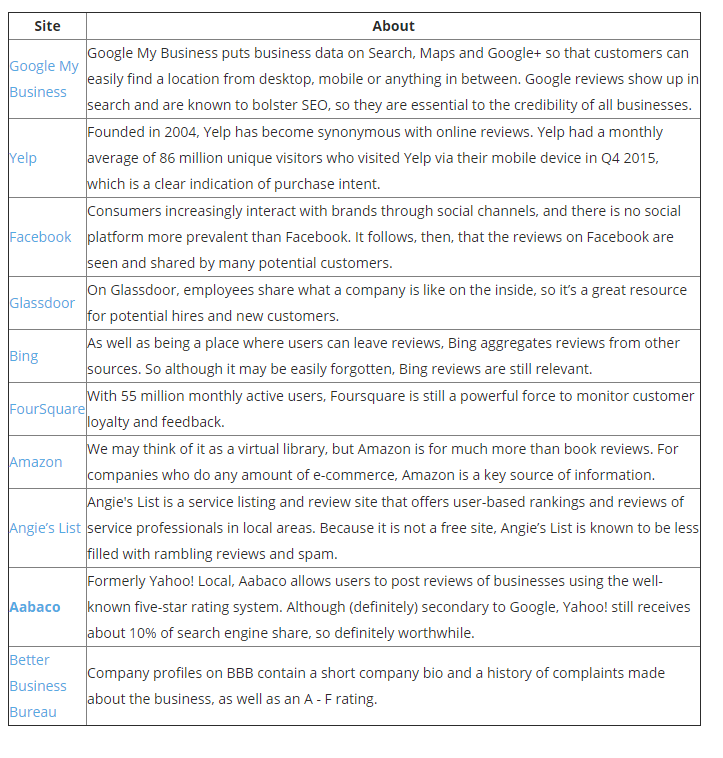 You’ll notice that there is some overlap between some of these directories and the order of importance for review sites below. As a starting point make sure to register with all of the top 10 reviews sites below as well as the top 15 directories above. Most of these will be pretty easy to setup. Be Sure Your Directories are Secure! If you do this manually make sure to use a service like LastPass to save all of your passwords or put them in a spreadsheet (that is preferably on your desktop, and not online). Be careful with this. While this may not have your social security number, it is important information for your business. Make sure to use passphrases or generated passwords that are longer (16+ characters is great). Most of these accounts you won’t be logging into often, and if you aren’t going to keep a close eye on them you want to know that they’re secure. As computers get more powerful hacking is becoming more and more of a problem. The Equifax data leak should be more than enough to illustrate this point. With that it is time to do a brief introduction of some guidelines for your single most important business listing: Google My Business. Google My Business (or GMB) is the single most important listing your business can have. It is verified by Google when they send out a free postcard to your address with a verification code, and that is part of what makes it more reliable than other listings. Google wants to have correct and informative information, not just any information. 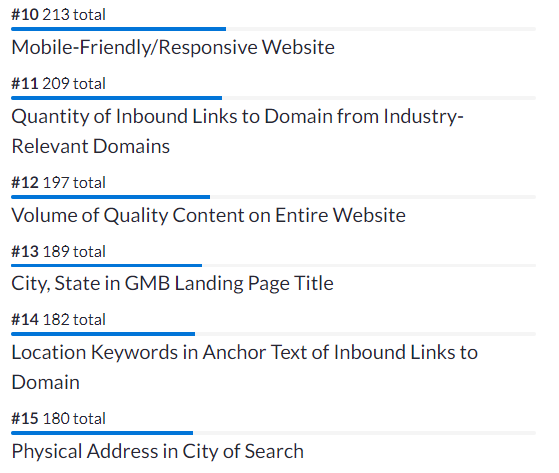 As you can see, #13 is city, state in GMB landing page title is #13, and physical address in city of search is #15. Both your GMB account and your physical location and proximity to the searcher are still important in local organic search. Foundational factors are just what they sound like, as they are some of the most important aspects to build your foundation for showing up in local search results, whether it be for a Google 3 pack or local organic search. They are the first steps that should be taken to start a solid online presence for your business, but continual focus on them is not necessary once they are established. 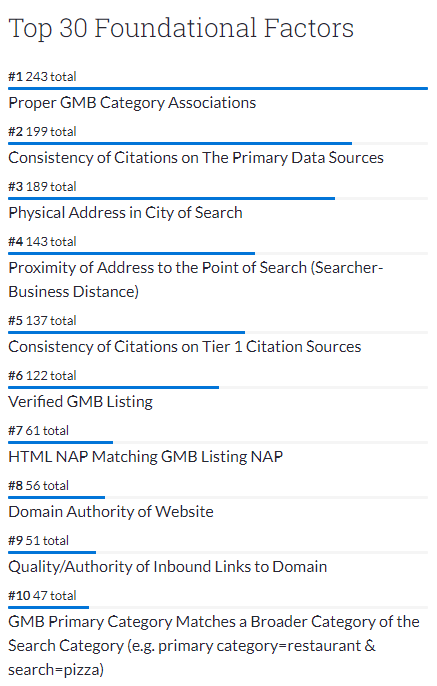 Since citations are talking about your listings of your name, address and phone number (NAP) that means 8 out of the top 10 refer to either your NAP consistency across citations or details about your GMB itself! 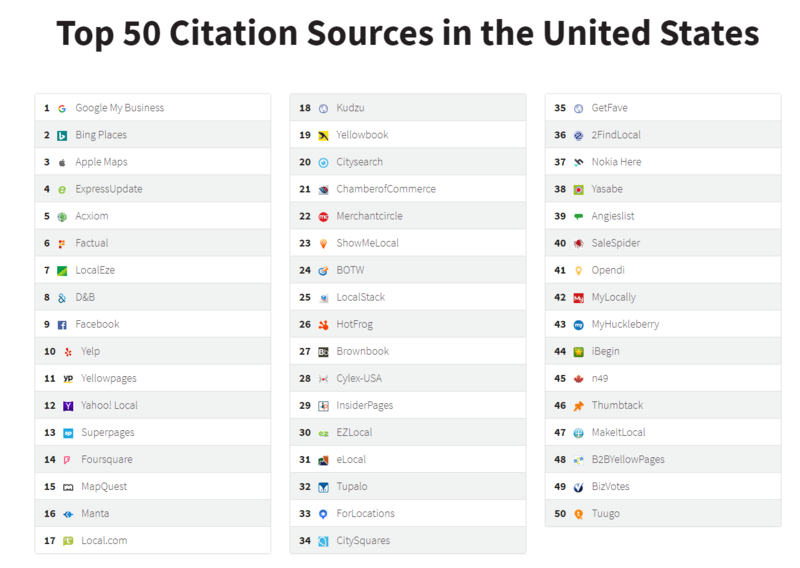 The only two that don’t are at #8 and #9 and those are more traditional factors of general SEO. So let’s get into how to do a Google My Business properly. There are a number of guidelines that are important to adhere to for Google My Business to make sure your company gets the most out of its Google My Business listing and avoids any potential penalties. Some of them might be surprising. Here we’ve gathered some of the most important issues that people might run into with a Google My Business listing. …a business must make in-person contact with customers during its stated hours. Make sure your address is accurate down to the character! Explicitly discourages the use of call tracking numbers! List your hours unless they vary unpredictably (based on activities, movie showtimes, classes, etc.) If your hours vary predictably it is worth the time to set them up. You can set special hours individually or by uploading a spreadsheet to your Google My Business account. Make sure to check details for uploading a spreadsheet first. Be specific when choosing a category. For example, choose “Nail salon” instead of “Salon”. Use additional categories to let customers know more about the specific services you provide. If you manage a grocery store that includes a pharmacy and deli, you would choose “Grocery store” as your primary category and add “Pharmacy” and “Deli” as additional categories. It seems like Google would be the expert on how to use Google My Business, right? In this case, maybe not. Google has changed their tune on this one over the years, and both SEO authorities like Yoast and a case study by Local SEO Guide’s Dan Leibson would suggest that you could be significantly limiting the search results you show up in by picking only 1-2 categories. They aren’t the only ones. From experiential knowledge across a number of non-Google sources it seems that finding as many specific tags that relate directly to your business is the best. Google can figure out more general categories based on more specific categories, but it may not do it so well the other way around. This could be worth experimenting with and because it is not an exact science, but be careful and make sure you track results properly. When you do experiments make sure to use some sort of rank tracking software and give each new set of categories a few weeks to take effect. I would recommend keeping your testing to only 2-3 combinations, as Google could potentially penalize changing categories too often. If you have multiple locations that all do the same thing use the same exact name for them all- do not include locations in the name to differentiate! Each location will have its own reviews! Google wants to focus on the local and individualized experience, so this is not likely to change. Those are the parts of the Google Guidelines for Google My Business that stuck out as being the most surprising or unexpected. That should be enough to give you some pretty good direction as you fill out your profile, but if you have any other questions you can take another look at the resources provided throughout the section. While Google is usually a good first source for information here, with some instances such as categories they are not always the best source for your business. Remember, Google’s first job is to protect the integrity of their search results. They don’t care about how your business ranks in them. That’s why they are not to be trusted fully when it comes to their advice. In some cases, they are encouraging people to do things that will make their business less likely to show up in search results. Can I get a Google Certified SEO? No. As mentioned previously, Google does not always give the best advice. In fact, they don’t want people to know exactly what makes them rank, otherwise, they can beat the system. SEO is a constant game of people trying to figure Google out so they can rank better and Google trying to continually advance its algorithm so it can penalize anyone trying to game the system and give the best, most honest results possible. There is no such thing as a Google-approved SEO, and there likely never will be. I have heard this claim made before, and it is false. Anyone who makes it should not be trusted with your business. Google AdWords is different and Google does teach you to get better at that and give out certifications, but do not confuse this with SEO. SEO is learned through trial, error, success, and research. There are plenty of tools that can help you get an idea of where your website is at, including our free SEO audit tool or finding out how to do an online assessment of your website. How Important are Reviews to Local Rankings? 52 percent trust authentic online reviews as much as word-of-mouth from friends and family, and in another similar survey 51% of people found online reviews more important than those of friends and family! Reviews are very important to your business, your local 3 pack results, and to your local organic search results, in that order. Underestimate their power at your own risk. As the statistics above show, good reviews are very important to getting new customers, and many marketers estimate it is over 20 times as expensive to get a new customer as it is to retain a customer you already have. While reviews are estimated to be about twice as important for getting a local Google 3 pack ranking as they are for local search rankings, when used wisely they can be one of the most important assets to your business. People increasingly use reviews as one of their last qualifying steps to figure out if they are going to buy a product or service from a business, but with 40% only looking at 1-3 reviews it can be a bit of a crapshoot for what they see unless you actively encourage positive reviews. By knowing the guidelines of each of the major review platforms and you can do your part to get a steady stream of good reviews across the board, and hopefully prevent as many bad ones as possible. Many bad reviews are a result of people not feeling like their concerns were addressed or heard, and so they go to a place they know people will hear them forever: the Internet. Bad reviews happen sometimes and can be unavoidable eventually, but there are a number of things that can help curtail them and make sure there are as few as possible. A lot of getting good reviews comes down to running a solid, customer oriented business. The foundation of it is treating your customers well and letting them know that they can tell you if something is wrong in other ways so they don’t have to do it online. 2. Give customers ways to give you feedback on what you can improve that don’t involve reviews! Make sure to respond when you have a level head! Emotional and reactionary responses can make a business look bad. Sleep on it if need be. Be careful with wording, especially if you choose to offer free stuff, as this might encourage other people to post bad reviews. In some cases may be more appropriate to make these offers in private. 5. You can respond to positive reviews too, as this can encourage people to post them! Personally, I don’t think that list is very helpful, but I wanted to share it for reference. I have now made a list that is my own personal opinion. If a number is missing between items it is because the previous one is that much more important! If you’re short on time do the top 3. Those are by far the most important. Google and Facebook it is ok to request reviews, but Yelp it is not. Yelp also has a pretty bad reputation for essentially blackmailing businesses by hiding good reviews after a business refuses to buy advertising, so in my opinion, there’s even less reason to focus on getting reviews there due to the lack of ethics of the company. You could build up a lot of reviews only for them to be gone from sight tomorrow, and reviews are generally hard won. Yelp reviews will happen eventually, especially for restaurants. It is worth monitoring, but focus most of your efforts on Google. That should be enough to get you started for reviews. They are important, but you don’t need to have reviews on everything. Once every six months to a year take a look at all of the reviews relevant to your business to see what people are saying. Sometimes reviews can give valuable feedback on things that can be improved, and bad reviews can often give valuable feedback on how to avoid future bad reviews! Local SEO is no different than general SEO in that it is always changing. Don’t be fooled by trying to use old shortcuts to get your business ranking in search results. While Google results are still the most refined for broad level searches, local has seen several big algorithm changes over the years. In early 2017 we brought on one client that had 1,000s of duplicate pages that were created because they thought Google would see all the content they had relating to their subject matter and rank them highly for it. If it was 2007 then that might have been the case, but in this day and age, they were getting penalized. It took months to fix. Unique content is very important. Be careful who you get your information from! Keyword stuffing- This hasn’t worked for years. Use keywords naturally. Getting as many backlinks as possible- Quality is much more important than quantity, and this can be measured rather easily. Quantity can be helpful, but getting a ton of links from the same domain isn’t. Duplicate content (as mentioned above)- Don’t do it. If you have to do it for legal reasons that can be overlooked, but if it is clearly for SEO reasons you will be penalized. Titles and Metas- Should be structured for readers and users and not keyword placement, as keywords in meta descriptions have been declared to no longer be important by Google since 2009. We do not completely believe that and would still recommend including your primary keyword(s), just make sure to make it readable and enticing. Creating a separate page for slight variations in keywords-Google is smart enough to figure out that one big page that includes relevant related keywords is a good fit now, and it now thinks those pages are a better fit than smaller pages targeted for individual keywords. If you have pages from this bygone era you might consider combining them and doing redirects for the ones you delete. Keyword density: It isn’t as important as it used to be. You need to use your keywords on your page, but hitting an ‘optimum’ isn’t necessary. We would still recommend not going over 2.5% keyword density. Keep it natural. 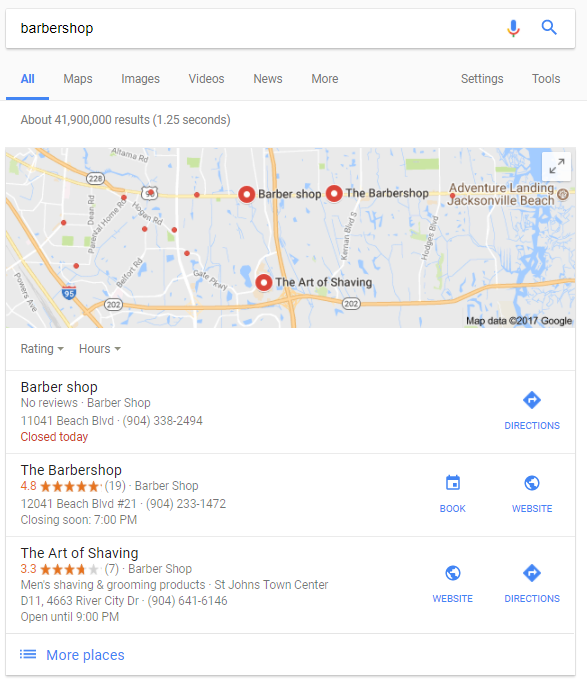 Google local results are now significantly better than what it was, although the recent change to consider proximity to the searcher as one of the biggest factors does seem to be a bit of a step back in some situations, as demonstrated above with the ‘barbershop’ example. Short of hacking Google Maps to place your location all around the country (which I do not recommend at all) this offers little opportunity for businesses or SEOs to take advantage of. I think that is part of the point. 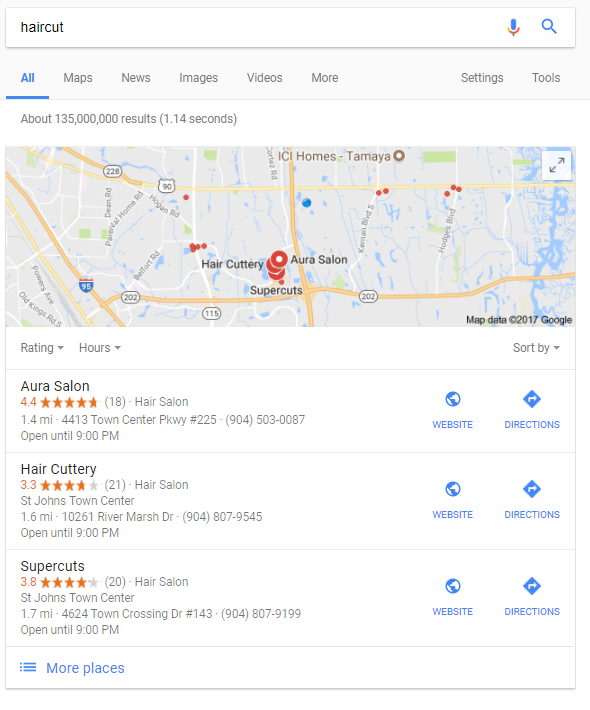 However, I am surprised that they will turn up a business with no website or reviews in the #1 position just because it is .1 miles closer than one that has numerous positive reviews, a website and ability to book a haircut online. To me, that does not seem to be what is best for the user. That said, I’m sure they have their reasons. It may also be fixed in an upcoming update. 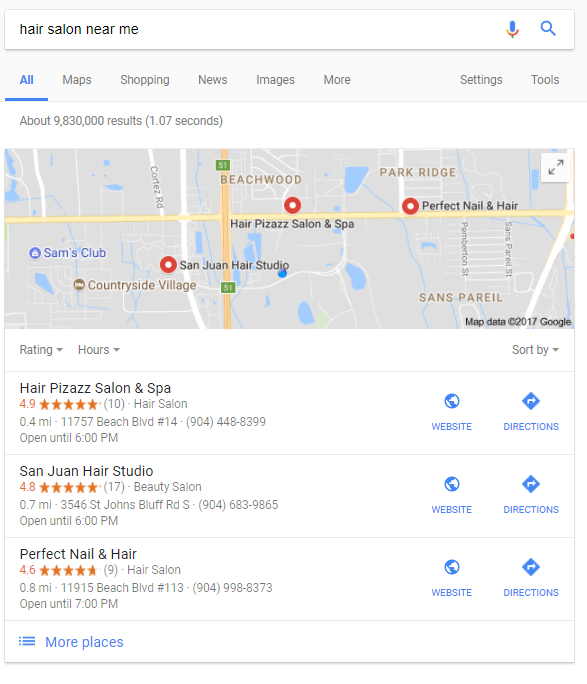 Here is a brief overview of some of the major changes in the Google local results algorithm so you can more easily spot outdated tactics that should be avoided. While Pigeon was overall an improvement, it still left a lot to be desired. The physical location of the searcher is out of the control of a business, but it also helps to level the playing field somewhat for smaller businesses that may have a good location. This also means that your location is important both physically and virtually; if nobody searches for your services in your area it will be harder for you to be found! Google announces more mobile friendly sites will be favored in search results and that information from indexed apps will increasingly be used in search results. Despite the name, the changes didn’t seem to be that significant. Mobile optimization had been getting more important for a long time, and this may not have been a big change because a high percentage of sites were already mobile responsive. Learn more about the Possum update. If you don’t have much time, what do you focus on? Focus on the fundamentals. Most of these things you only have to do once, then you can start focusing on other things, but they are all very important for your rankings. With 8 of the top 10 foundational factors being related to your business listings and GMB account these can be taken care of by carefully creating your GMB account and either going through all of your local listings manually or using a service like Moz local to help speed things up. 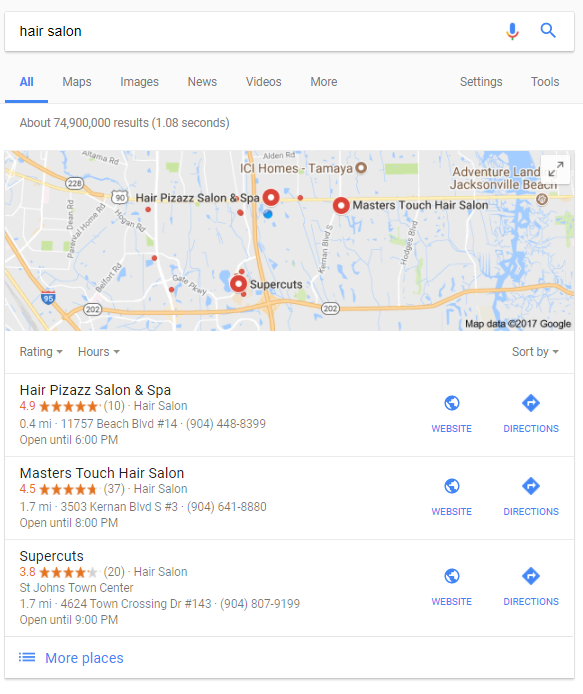 There are a lot of different factors to take into account for both Google 3 pack results and Google local search results. I will delve deeper into both local organic search results and 3 pack results in separate upcoming posts. If you’re curious where your site stands in beyond local search and Google 3 pack results you can do an online assessment of your website. What it comes down to is that getting your business set up for local search success is going to take time and effort. If you are just starting off and don’t have any money, then you can probably put the time and effort in yourself. Just make sure that you are getting your information from reliable sources, as doing the wrong things will not help, and it can even get you penalized. If you already have revenue and are short on time, then it may be best to reach out to someone like Multiverse Media Group to take care of your online presence so you can show up in local organic search rankings and 3 pack results. Want Multiverse to Do the Work For You?